Here’s a list of stocks you might find interesting. It contains five consistent dividend payers that are debt free and highly profitable. Companies like this are often very successful, with competitive advantages that allow them to grow while paying out much of their earnings as a dividend. Their lack of debt also gives them greater flexibility, which means they are less likely to cut their dividend when they run into problems. PayPoint has developed a range of technology solutions to make payments simpler. So for example it has physical terminals in shops such as your local newsagent or Tesco Express. You can use those terminals to pay your bills, top up your mobile phone or make energy meter prepayments. In terms of online payments, you can use PayPoint technology to pay for parking via your mobile phone, and it was one of the early developers of internet payment services, which it still provides for sites like MoonPig and WHSmiths. The chart below shows how successful the company has been over the years. As a technology business, it doesn’t have to spend vast amounts on new factories or other capital expenses (capex) in order to expand. Its average net ROCE is extremely high at 34% and capex is usually about 20% of net profits, which is quite low. As a result, the company can pay out most of its earnings as a dividend and still grow rapidly. I don’t own the company, but I think I would be happy to, although I haven’t run it through my investment checklist. IG Group is the world leader in spread betting and contract for difference (CFD) services. It is also the UK’s leading provider of foreign exchange (forex) trading services for retail traders. Recently it moved into execution-only stockbroking, where it hopes its advanced technology will provide a good alternative to existing execution-only platforms. 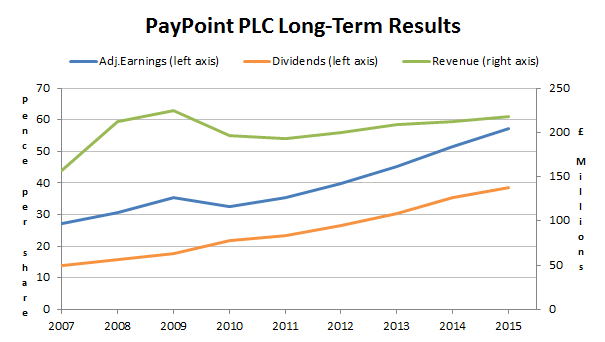 As with PayPoint, IG is primarily a technology business with no need to build factories or buy other heavy (and expensive) equipment in order to expand (capex is typically very low at just 10% of post-tax profits). Again, this means it can pay out most of its earnings as a dividend and still expand rapidly as the chart below shows. Of this group of five companies, this is the only one I currently hold, with IG making up about 4.5% of the UKVI portfolio and a similar amount in my personal portfolio. I bought the company’s shares in September 2014 and so far they have done very well, producing 5.1% in dividends and 29% in capital gains. Of course, nine months is far too short a period to say anything about how the investment will work out over the longer-term. Victrex is the world leader in high-performance aromatic polyketone solutions. And no, that doesn’t mean anything to me either. In layman’s terms it means they design and manufacture plastics for use in high-performance situations, such as smartphones (thinner, lighter), cars (durable, low friction) and aeroplanes (strong, light). The company started off as part of ICI where the polyketone (PEEK) patent was filed. Eventually, Victrex was bought out by management and subsequently listed on the London Stock Exchange. The company has been extremely successful over many years, only stumbling very slightly during the financial crisis. Early in its life Victrex relied on its PEEK patent, but that has long since expired and supplying the basic PEEK resin is now a commodity business with unexceptional margins. Rather than patents, Victrex now relies on its deep expertise with PEEK to keep profitability high. It does this by developing novel PEEK compounds and inventing PEEK-based products like films, coatings and pipes. It also works closely with customers to develop bespoke PEEK-based solutions. 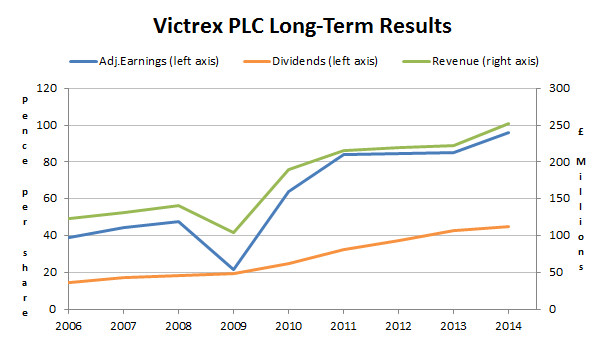 Victrex is another low-capex business, with capex usually around 50% of post-tax profits. That’s more than the previous companies in this list, but still below the average for companies in general. Aveva develops, sells and supports computer software. It sells this software to companies that are involved in large, complex engineering projects such as those in the oil and gas sector. Its products typically fall into one of these two categories; engineering and design systems or enterprise solutions. Having worked in the software industry, I know that large, complex pieces of software that are tailored to a customer’s specific needs often become a key part of that customer’s business. It becomes very difficult and expensive from them to switch supplier and so companies in that situation tend to stick with the same supplier for many years or even decades. 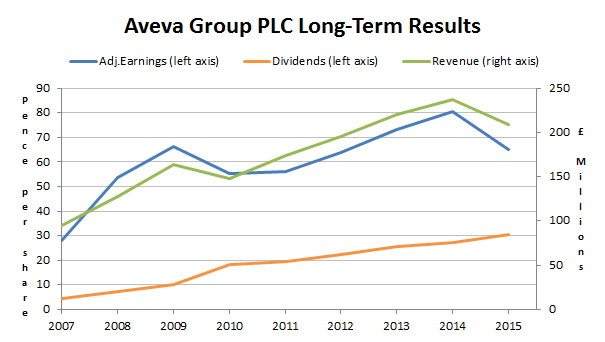 Around 70% of Aveva’s revenues are annually recurring, so the company has good forward revenue visibility. As a software company, it has no heavy capital expenses to make, although it does need to spend heavily in order to continually develop new, better product offerings. The company has a solid 10-year Growth Rate of 13.8% (which I calculate as an average of revenue, earnings and dividend growth over a decade) and investors must be expecting that high growth to continue, otherwise it would not make sense for the shares to have a sub-2% dividend yield. Greggs is, of course, the well-known high-street baker, although it’s probably incorrect to call the company a baker as nothing (as far as I’m aware) is baked in-store anymore. But that hasn’t stopped the company from being extremely successful over many years. In fact, recently it’s had a bit of a growth spurt, as the spike in earnings and dividends in the chart below shows. The share price has also rocketed up, having gone from 400p in 2013 to 1,200p today. I did own this company for about three years, but sold in 2014 for just under 600p (which is either irrelevant, or means I’m an idiot, depending on whether you think future share prices are knowable). 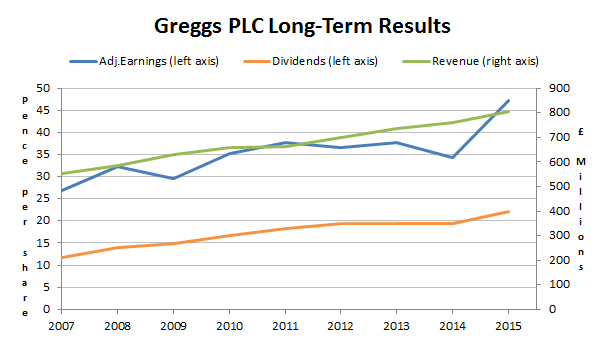 Regardless of what the shares are doing, Greggs has been a class act for a long time, and its ongoing transition from a traditional baker to a food-on-the-go retailer is helping it to stay highly profitable. As a retailer Greggs rents rather than owns most of its high street locations, which tends to flatter return on capital employed. Some investors like to capitalise lease expenses, although it isn’t something I do (yet). So there you have it. A list of five companies that are consistent dividend payers, debt free and highly profitable. I’ve owned one of them in the past, I own one of them today, and I’d probably buy the others if the price and timing were right (after a somewhat more detailed analysis, of course). Nice list of companies, John. A couple keep coming up on my radar occasionally. Especially Victrex, Aveva and Greggs. Why in particular do you think Aveva will not be able to keep up the pace of growth in the future? Just because it was so rapid in the past? IG I had not really looked at before. Tullett Prebon has popped into view a little more than they have. I will definitely take a look though as they look interesting from the little snippet you provide above. Thanks again for drawing our attention to them! Actually the Aveva 30%+ Growth Rate is wrong. There was a data error which was messing up the results. The actual growth rate is 13.8% which looks much more sensible (and potentially sustainable). I’ll fix that bit in the original article as well. Thanks for bringing it up. It doesn’t change the other figures though. It still has the same high profitability and 13.8% is still a fantastic rate of growth. Hi John, thanks for pointing that out. It looks like I’m going for some sort of typo world record in this article. Yes, Victrex at 208p would be nice, but sadly it’s not possible so I’ve corrected the article to 2,087p. Hi John, 5 Good companies. My two penneth worth thinks that all are handsomely priced, except PayPoint which looks very good value right now. Managed to get in close to the low of late and will probably hold this one for quite some time. One thing to be aware of though is that it’s not bullet proof and in fact certain aspects of it’s business have not performed well including the parking payments business which is loss making and the company recently announced is up for sale and the online business also which is far too competitive. I like the online payments business a lot and bought very heavily into eBay for the pending spin off this year of paypal which has phenomenal growth and high margins. PayPoint has a very well established footprint in general retail businesses and the Collect+ idea is a real winner for such local convenience for drop off and pick up of goods in parcel form that is a growing trend with online shopping. I dare say you will run the slide rule over this one more and I’d love to see your report on that to see if you can see any gotchas that I may be missing. I’ll certainly keep a bookmark on Victrix, which hasn’t been on my radar screen but certainly is now as they have a really strong technology base on first glance. 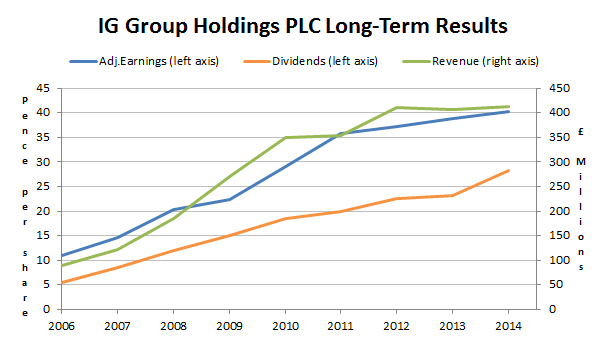 I am, rightly or wrongly, not too interested in Greggs, Aveva or IG but they sure have performed well as a bunch. Yes, I think I’ll probably end up reviewing and perhaps buying PayPoint if the price stays low and if there are no hidden nasties. One issue I have at the moment is that I like to keep half the portfolio in defensive sector stocks, and I need to add one or two defensives to hit that target (and/or offload some cyclical stocks). I will be selling a cyclical dud very shortly and then probably buying something defensive after that. But given that I only like to make one trade a month, it may be a while before I get around to looking under PayPoint’s covers. 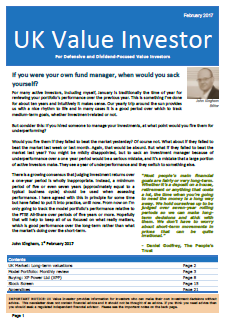 Hi John, Good idea on the slow approach to investing. I go for months constantly scratching my head, reading stuff and very rarely, and especially so with the market at current levels, find anything that is worth buying or adding to. 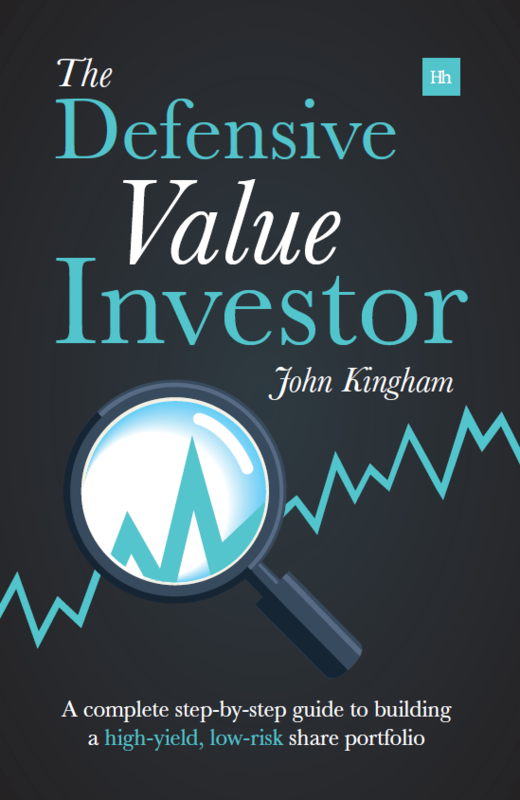 Defensives (as a category) is an interesting concept and quite often many assume so much about the term defensive and apply it to companies because they have historically been classified under this description. Take utilities, it’s a given in most people’s mind that utilities are inherently defensive, but I am beginning to suspect many of them are very exposed to very high debt levels and the danger of the withdrawal of certain key government subsidies as the said governments continue to scrabble to reduce costs or try in vein to reduce huge deficits. The threat of rising interest rates also hangs over them like the sword of damocles. I regard defensive stocks as those that have a strong portfolio of brands that command massive customer loyalty – the rest is largely down to politics and at the mercy of the flippancy of the changing face of the pencil-necks in government circles. Excellent points on defensives there LR. I tend to define them by sector, even though this is, of course, flawed (as is pretty much everything in investing to some degree). My assumption is that on average, over the long-term, defensive sector stocks as a group will fit that description better than cyclical sector stocks. But yes, it’s always good to remember that being a defensive sector stock isn’t some sort of divine right to be defensive in reality. Exhibit 1 is Tesco (or any of the supermarkets for that matter). Should a comparison of the ROCE be made with respect to companies in the same industry? For example I noticed the banks such as HSBC and Standard Chartered have very low ROCE values but in other respects look reasonable investments. Hi Andrew, I don’t generally pay much attention to industry when looking at ROCE. As far as I’m concerned a return is a return is a return, and the higher the better. However, in regard to financial companies (banks and insurance) I use ROE instead of ROCE because of their balance sheet structures. It just doesn’t make sense to calculate “capital employed” by banks and insurance companies. I have found that (10-year median) ROE for finance companies is roughly comparable to (10-year median post-tax) ROCE for non-finance companies, in terms of the percentage values and the implications for the attractiveness of the business.